Like many pilgrims visiting Galilee, my family tried to pack as much as we could into each day. We saw important places such as Jesus’ town of Capernaum, the Mount of Beatitudes, and the Church of Multiplication of the loaves and fishes at Tabgha. Near the end of one meaningful but long day, my mother asked if we could stop at Magdala, the hometown of Mary Magdalene. She at least wanted to take a picture. We stopped, thinking that we would be there only a couple of minutes. And, to our surprise and delight, we discovered a jewel on the northern shore of the Sea of Galilee. The site has amazing first-century ruins including a synagogue, mikveh baths, homes, streets, and mosaics. Archeological digs are ongoing, and the findings surely will continue to be important. The site also houses the Magdala Center, a Roman Catholic endeavor dedicated to women’s well-being and wholeness. Eventually, a conference center will be built to welcome groups for retreats and gatherings. 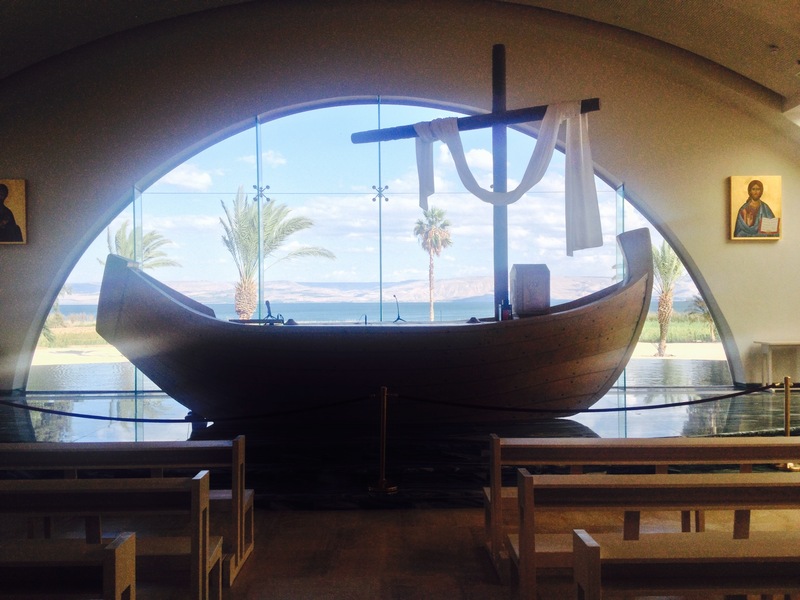 Very near the shore of the Sea of Galilee, a chapel was completed earlier in 2014. The architecture is beautiful and deeply inspiring. The colors replicate those found in the first-century synagogue on the site. The entry rotunda includes seven pillars inscribed with women’s names from Scripture. An eighth pillar is left blank, inviting women to include themselves among the faithful ones loved by God. Four chapels surround the rotunda, and each one includes a mosaic depicting a scene from Jesus’ ministry. The main chapel’s altar is in the shape of a Galilean fishing boat. During worship, congregants look at the altar, then through glass panels out to the sea. They are invited to recall Jesus’ words in Luke, chapter 5, encouraging the first disciples to go deeper into the water and put down their nets. In the years to come, as funds are provided, the Magdala Center and its work will grow. If you have an opportunity to visit, I encourage you to do so. To learn more, go to http://www.MagdalaCenter.com. This entry was posted in Family Travel, Travel on October 26, 2014 by Dean Allen. While visiting Galilee, my family travelled north to the Golan Heights to experience the setting of one of Jesus’ important teachings. In Matthew 16:13-20, we read that Jesus went with his disciples to Caesarea Philippi. He asked them to describe others’ perceptions of him. Jesus asked, “Who do people say that the Son of Man is?” They replied, “Some say John the Baptizer, but others Elijah, still others Jeremiah or one of the prophets.” Jesus then asked the disciples about their understanding of him. Simon Peter replied that Jesus is the Messiah, the Son of the living God. Jesus called Simon blessed and said that he would build his church upon Simon Peter’s confession. Jesus finally promised that the gates of Hades would not prevail against his church. The setting for this teaching was a cave and spring where the Greek god Pan was worshipped and where Herod the Great’s son, Herod Philip, made his capital. Waters flowed from the spring, spilling through the cave, and it was known as the gates of hell. Jesus used the physical location of the cave to teach his disciples that their confession of faith in him would last longer even than the rocks where they gathered. 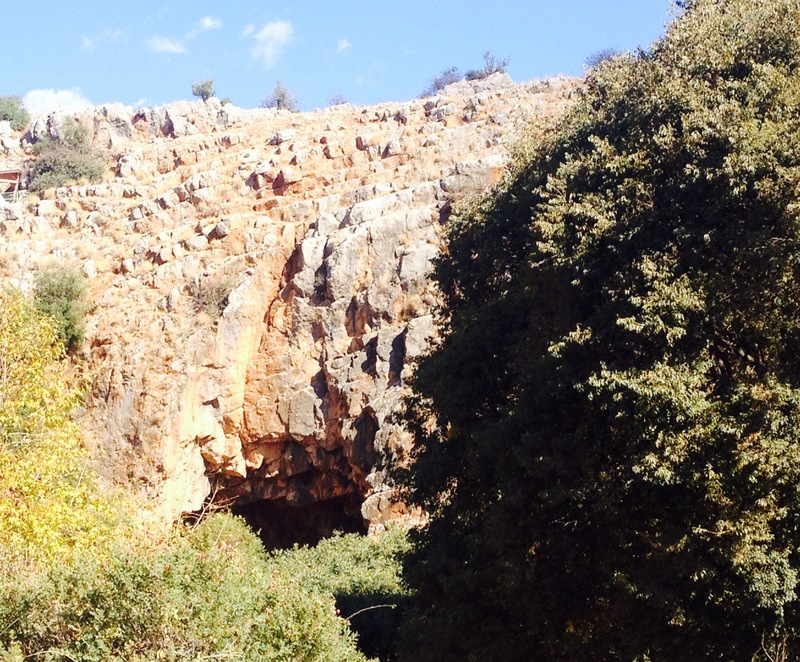 Today, the location is in the Banias National Park. It takes a bit more than an hour to drive north from Tiberias, but the drive is worth it. The setting is peaceful and beautiful. The waters coming from the spring and Mount Hermon, just to the north, eventually flow into the Jordan River and the Sea of Galilee. And, more than the physical beauty and tranquility, the experience provides an opportunity to see how the land and setting informed Jesus’ teachings. This entry was posted in Family Travel, Travel on October 25, 2014 by Dean Allen. 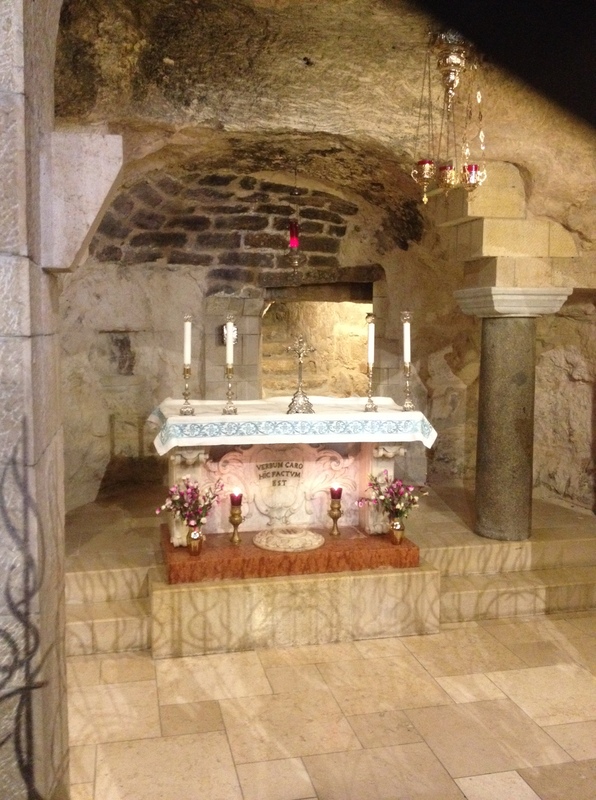 I celebrated my birthday with my family — my wife, son, daughter, mother, and father — in Nazareth. Like most Christian pilgrims, I was drawn to this place because it was the home town of Jesus. According to Roman Catholic tradition, Mary received word that she would bear the Christ child in Nazareth, The current church building was constructed above the Grotto of the Annunciation, the site believed to be Mary’s home. I was moved deeply to journey down to the grotto along with other pilgrims. It was a reminder of the depth, breadth, and width of faithful people following in the footsteps of other faithful ones who have gone before us. Later in the day, after a delicious supper, we stopped by a bakery to find a birthday cake. 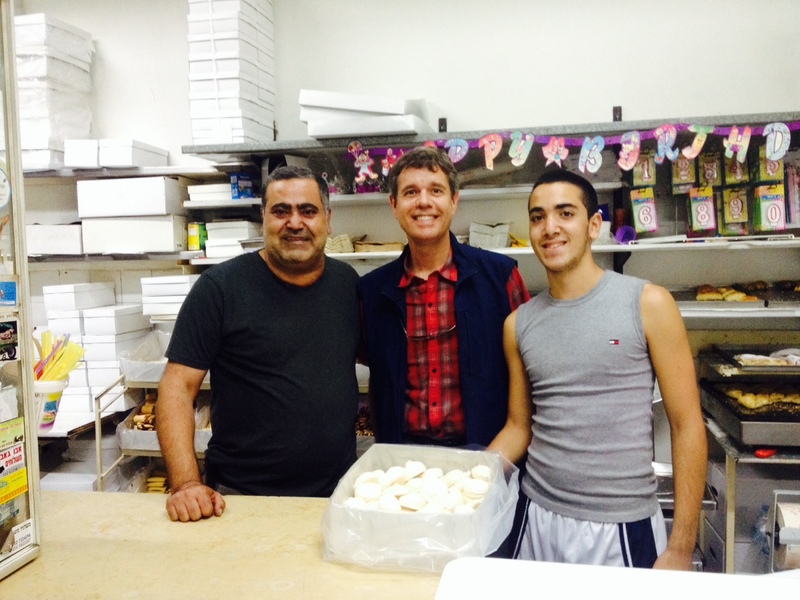 We met Danny and Bashar, the father-and-son team that had baked the delicious treats that I thoroughly enjoyed. I was delighted to talk with these two wonderful bakers and even better people. All of this made for a great day. I spent time with the people I love most. I journeyed to one of the most important places in my faith tradition. I met people from a different place with whom I shared great conversation. And, I created memories that will last a lifetime. A happy birthday, indeed! This entry was posted in Family Travel, Travel on October 21, 2014 by Dean Allen.